Criminal justice reform is on the political and social agenda in a way that hasn't been seen in several decades. The United States has become one of the largest incarcerating states on earth, and a movement to re-examine policies that have led to this sad state of affairs is afoot. A very basic but deceptively important question must be asked and answered in order to fully understand where our criminal justice system currently resides, and where it needs to be: What is the basis of our understanding of crime and punishment? Answering this question requires exploration of the philosophical development of modern criminal jurisprudence. 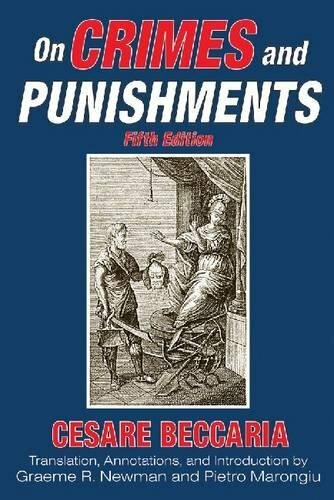 A first stop on this journey should be Cesare Beccaria's influential, classic treatise On Crimes and Punishments. Readers are fortunate to have available an excellent translation, complete with an insightful introduction and copious annotations by Graeme Newman, distinguished professor at the School of Criminal Justice at the State University of New York, and Pietro Marongiu, associate professor of criminology at the School of Medicine, University of Cagliari, Sardinia, Italy. Cesare Beccaria (1738–1794) was a philosopher and politician who is known as one of the founders of modern criminology and penology. He lived, worked, and wrote during the Enlightenment, a period of great change in western thought and behavior. The themes that he explores in On Crimes and Punishments were on the cutting edge of progressive thought at the time. Indeed, the authors argue that there is substantial evidence that Beccaria's work directly influenced the philosophy of the founding fathers, as well as the language of the Declaration of Independence. Beccaria's highly influential work is organized around three central ideas relating to crime and punishment: the social contract, the value of science, and a strong belief in progress. Beccaria argues that the utilitarian ideal of the greatest happiness for the greatest number should apply to crime and punishment, and that even in the morally complex realm of criminality, great happiness for a great number can be achieved through proper policy. Such policy, however, is only capable of controlling the behavior of man when subject to a binding social contract. A man gives up some amount of liberty to the state in order to stave off violence, anarchy and chaos. Justice arises, but as Beccaria notes, "human justice—or more accurately political justice—represents the fleeting relationships between the actions of men and a constantly changing society." This is why, according to Beccaria, justice must be grounded in sound principles of science. He goes to great lengths here, categorizing crimes and attempting to determine the proper measure of a crime by the harm it does to society. If this is possible, through science, the exactly appropriate form of justice can be meted out. Where Beccaria's work stands out and most informs the modern reader is in his unwavering belief in the power of progressive thought to continually improve criminal justice policies. Beccaria was opposed to the death penalty at a time when it was quite common. He also believed strongly in the progressive (at the time) idea that "[i]t is better to prevent crimes than to punish them." Anyone interested in appreciating the extent to which the American criminal justice system is an abject and grotesque failure should read Beccaria's On Crimes and Punishments. It can be a frustrating read, not because of its broad philosophical underpinnings, but because of the very practical and sensible ideas put forward to improve the value and efficacy of a criminal justice system that still remains to be implemented in our "modern" system. Case in point: Beccaria argued strongly for the education of errants, suggesting what we know to be true today: education reduces recidivism. It has been more than two centuries since Beccaria's writings were published, and efforts to ensure that the convicted and imprisoned are educated remain woefully inadequate. Will the American public come to its senses, and will the criminal justice system receive the complete makeover it so desperately needs? Here's to hoping that Beccaria isn't turning over in his grave as we still debate policies on crime and punishment.